↑ MGM head Louis B. Mayer first tried to talk Stewart out of enlisting, claiming he would be sacrificing his career. "Mayer was just so desperate to say something that would keep me from enlisting", recalls Stewart... I said, "Mr. Mayer, this country's conscience is bigger than all the studios in Hollywood put together, and the time will come when we'll have to fight...The next thing he did was announce a big going-away party for me, and every star at the studio was summoned to be there... That was one big party." ↑ "James Stewart profile". FilmReference.com. Retrieved January 11, 2011. ↑ "Ancestry of Jimmy Stewart". genealogy.about.com. Retrieved October 28, 2012. ↑ "Movies: Best Pictures". The New York Times. Retrieved March 7, 2012. 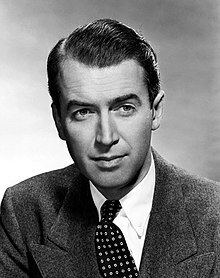 ↑ "Jimmy Stewart profile". adherents.com. Retrieved March 7, 2012. ↑ ক খ Eliot 2006, pp. 11–12. ↑ "Fourteenth Census of the United States: 1920", enumeration dates January 8–9, 1920; 4th Ward, Indiana Borough, Indiana County, Pennsylvania. Digital copy of original census page, FamilySearch. Retrieved August 3, 2017. ↑ ক খ Eliot 2006, p. 15. ↑ Eliot 2006, p. 31.